TWO weekends ago, I traveled 40 minutes northwest of Phnom Penh by tuk-tuk, the ubiquitous three-wheeled form of transport in Southeast Asia. I was going to see something strange: Cambodia’s first Jewish cemetery, which was inaugurated in April. The cemetery is the brainchild of Rabbi Bentzion Butman, who has run the Chabad Jewish Centre of Cambodia for the past five years. When the driver asked me where I was going, I said “cemetery.” I didn’t know the word for it in Khmer. Because of cremations, a cemetery is a rare sight, and knowing the word for it in English is rarer still. I made shoveling gestures into the ground, closed my eyes and leaned back a little. The driver responded by making a tombstone shape with his hands, as if to say, you mean these? I told him it was an “Israeli” cemetery, which was, in a sense, correct, since a man with an Israeli passport was the only person buried there. The small plot of marked-off land sits at the end of a long road flanked by tall trees that sway in the wind. We reached it just before dusk. The tuk-tuk driver, who told me his name was “Ian,” had located the cemetery by asking a market vendor if any foreigners had recently been buried in the area. We walked off the road into the cemetery and over to the one grave, marked by a coffin shaped gravestone with no name on it. MOST days, Rabbi Butman greets visitors from behind a large wooden desk in his Phnom Penh office, located on a quiet street not far from Cambodia’s Royal Palace. Transparent glass doors make it easier to see who is approaching and who is leaving. He can spot visitors once they are buzzed in from the locked street side door, a set-up that feels compatible in a country of pat downs and secured homes like Israel, where he was born, but is a little out of place in sleepy Phnom Penh. Though the Jewish expatriate community is small – about 100, but numbers are difficult to pin down since many come for a short period of time on business or for an extended vacation – the mission keeps him busy. During the course of our hour and a half conversation, he received several texts and phone calls. One was from a writer from Michigan, who wanted to do a story about the cemetery (which is apparently for the Jews who decided they did want to be left behind, but in a Jewish way.) Butman has a higher profile than most Chabad House rabbis. The local papers have all written about him, and he was featured in an Economist story about the growth of Chabad around the world. Of the more than 3,000 houses globally, he gets a disproportionate amount of attention. Not that it bothers him. “There’s Chabad in Nigeria now. In the Congo there’s Chabad for 15 years. There’s Chabad all over, but Cambodia is one of the most quoted places,” he said. Your name caught may attention as I was reading through the posts on the CPN [Cambodia Parent Network, an expat forum]. As a Rabbi in a remote community, I spend time ‘Jew Fishing’ regularly, as we put the motto of our center to be ‘No Jew Will Be Left Behind’. “If we were looking for the practicing Jews, we would open this center in Brooklyn,” he wrote, appending a smiley face. “I am sorry if you feel this email is interrupting your privacy. Butman was born and raised in Lod, a city in Israel near the airport. His family has been part of the Chabad movement – which has its roots in Czarist Russia – for several generations. In Lod, his father is a principal at a Yeshiva. It was natural that Butman would also serve. He is one of 14 siblings, several of whom also lead missions, though none in places as far-flung as Southeast Asia. “When people ask me ‘When did it start,’ the real truth is it started at home, it started when I understood that at some point I’d dedicate my life to the community, ignoring environment, ignoring challenges around, not necessarily choosing the place that will be comfortable,” he told me. As a young man, Butman moved to New York to go to Yeshiva there and continue his studies. He spent two years at another Yeshiva in Toronto. By the time he was in his early 20s, he had returned to his hub in Brooklyn and obtained his rabbinical certificate. “And then I went out to hunt for my wife,” he told me. Through an informal connection, he met Mashie in Chicago, and they talked about the future. 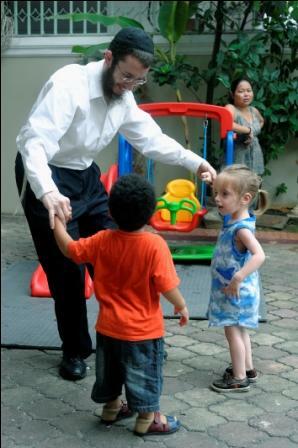 In 2009, a few weeks before Pesach, he was first offered the option to go to Cambodia, one of the few countries in the region without a Chabad house. Since the early 1990s, Chabad’s “roving Rabbis” had flitted in and out of the country on visits, but a permanent foothold was never established. The rabbi in charge of the region approached Butman. They didn’t know they’d still be here in 2014. They didn’t know that their fifth child would be born in Cambodia. FRIDAY night services at the Chabad house attract a core group of Jewish expatriates, mostly Israeli, and the occasional gaggle of travelers. On a recent evening, I entered the main doors of the house to find a long table laden with food. Where was everybody? Cambodian women cooking in the kitchen pointed upstairs, where a service was taking place. I was late. I put on a “Chabad Thailand” yarmulke (Butman is still finalizing the Cambodia design) and proceeded upstairs. Men were in front, women in back, separated by a partition. Like I’ve been doing most of my adult Jewish life, I picked an obscure corner in the least visible part of the room, picked up a book, and tried to follow along, despite not knowing Hebrew any more. The rabbi noticed me and came over with a different prayer book, with some English. This was more like it. Still, I was a little relieved when it was over and we all walked back downstairs to eat. There were about 30 people at the table, many of them travelers. Butman started out with only a database from previous visits of the roving rabbis, who’d left email addresses. He did his own outreach, posting ads in the English language newspaper the Cambodia Daily, which he described as “Jewish-owned.” Its founder, Bernard Krishner, was a longtime correspondent in the region. In addition to a host of charitable projects in Cambodia, he has donated to the Chabad house. 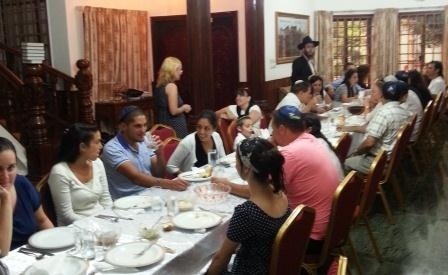 For the first seder, 70 Jews turned up. The numbers have fluctuated up and down from that average ever since, depending on the occasion. With pride, he told me that the Bris of his son attracted 100 local Jews. The meal was delicious and filling: Israeli salad, what looked like falafel but turned out to be a kind of fish. There was also Grey Goose and Stolichnaya vodka, which the rabbi poured into shot glasses for those who wanted a drink. I had a few while passing out tourism advice with alcohol-supported confidence to the French guy sitting next to me. There was a little goodbye celebration for a tutor of the rabbi’s children, who gave a speech in Hebrew. There was an Israeli-born businessman who told an American Jew with Iranian roots that all the jokes in Israel are about Iranians. Why not Russians? someone interjected. You don’t make jokes about people you are afraid of, he said. I was one of the last people to leave. THE past five years have not been without challenges, personally and professionally. Butman doesn’t see his extended family often, though some, including his parents, have made the trip to Cambodia. Other hurdles have popped up. When he first came, he wanted to be recognized by the government as a religious organization. In a country where Theravada Buddhism is the main religion, and there is no history of a sustained Jewish community, as in Singapore, Indonesia and China, this was problematic. Last year, the ministry received a certificate recognizing the centre as a religious organization functioning in Cambodia. When a shipment of prayer books were held up at the post office, Butman brandished his new certificate. They were released. There have also been deaths in the community. In April, a Dutch woman named Daphna Beerdsen and her 19-month old daughter, Dana, were attacked in a home invasion in Phnom Penh. Beerdsen died in the house. The baby succumbed to head trauma wounds in a Bangkok hospital not long afterwards. Butman went to the hospital in Bangkok and sat with the husband. The family was not happy with publicity surrounding the case (it was front page news in the English language daily papers here) and Butman made the mistake of posting on an expat forum that the baby had died. Newspapers attributed the information to him and he began to receive phone calls about it (he also received calls from around the world asking if he thought it was an anti-Semitic hate crime, when in reality it was a robbery that spiraled out of control.) The police arrested a Cambodian man days later, and he is awaiting trial on double murder charges. The death of a Jewish tourist in 2011 put Butman into a reflective state. The body was cremated, denied of a proper Jewish burial. After discussing the incident with another member of the community, who expressed interest in local interment according to tradition, the idea for a cemetery was launched. In April, it was formally dedicated with one occupant, a 56-year-old Israeli man and street wanderer whom Butman had come to know over many months. He purified the body and helped prepare it for burial. It was the first time he’d come into direct contact with a corpse. Before I met him, I considered building a Jewish cemetery in Cambodia his crowning achievement. But he’s got new plans. Next up is the construction of a traditional bath, or mikveh, in Phnom Penh. He also wants to make more regular contact with Jews living in the city. “We’re here for the individual. We do have communal events, but the greatest success I feel we have here is the one-on-one,” he told me in his office. Before our interview ended, he prodded me to come to services more. I demurred, making half-promises. I asked if I my girlfriend, who isn’t Jewish, would be welcome too (No Jew’s Girlfriend Will Be Left Behind, perhaps?). “What do you mean ‘welcome,’ will I hug her? No,” he joked.